The popularity of meditation, particularly mindfulness meditation, has exploded in recent years. Because of this, huge waves of people are just beginning their meditation practice, or still working out the kinks, and could use some simple guidance. I don't pretend to know everything, but I have uncovered a number of tips and tricks from my own meditation practice over the years which I'd like to share here for everyone. I'm sure just about everyone can find at least a few tips from the 50 below which will help them move their practice forward or deepen their practice in general. Below are 50 meditation tips for beginners starting their own meditation practice (centered around mindfulness meditation practices). The title says meditation tips for beginners, but the reality is even if you've practiced for a while there's probably at least few points here you can use to take your practice to the "next level" so to speak. Meditation isn't just sitting in a crazy difficult folded leg position (the lotus position) with your eyes closed. You can meditate anywhere, any time of day, and in multiple positions with multiple forms. Expand your practice to your entire day and utilize multiple forms to see the real power of meditation. To learn how to meditate, or for ideas on where to start your practice, you can read How to Meditate for Beginners. It's a common misconception that you have to do meditate with your eyes closed, and while this is perfectly acceptable (for sitting meditation at least...), it's highly beneficial especially in the beginning to meditate with your eyes partly open to help you maintain alertness and avoid dozing off. Many traditions and backgrounds meditate exclusively with eyes partly open, never closed. 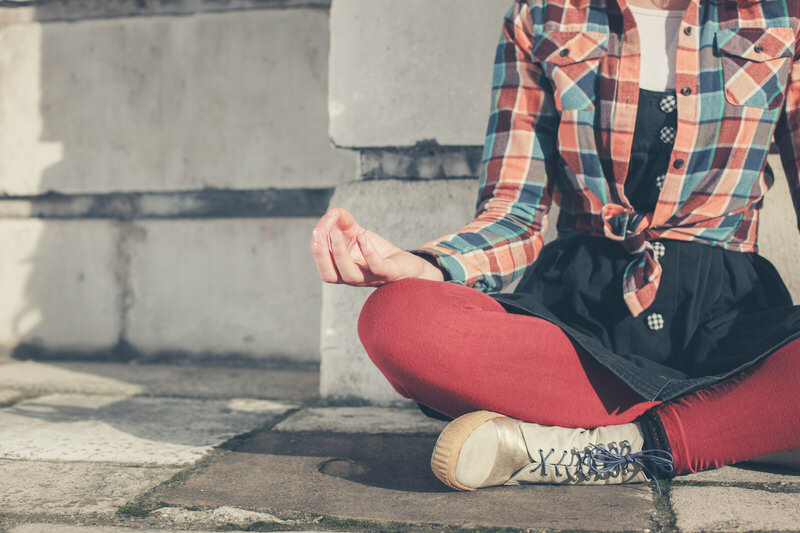 Don't jump right into walking meditation or mindful eating, start with breathing meditations. The most basic, most common, and most useful of which is mindful breathing. There's an exception to the last point. Whether you've just begun or have meditated for some time, if you feel a strong energy in your body, or are extra restless, you shouldn't force sitting in meditation, you should get up and walk slowly with mindfulness (walking meditation). This is a common practice that helps the practitioner calm their nerves so that they can sit more successfully. In the beginning, you should sit despite this restlessness, but if you've sat for a few weeks and still find yourself moderately restless it can be beneficial to do walking meditation for a moment and then sit after. This is also a valuable advanced meditation tip for those who are experiencing an abnormal level of restlessness. Once you've practiced mindful breathing for a few weeks I'd suggest you start trying out the various other forms of meditation. This usually begins with walking meditation and expands out to eating meditation, driving meditation, and so forth. It's limitless really, and I wouldn't just dive into them without some instruction, but you're free to experiment, find what works best for you, and structure your meditation practice accordingly once you're passed the initial phase of practicing mindful breathing. Keep in mind, I'm not saying don't sit in meditation, but I am saying that you can sit for half a day in meditation or you can sit for 30 minutes and do other meditative forms, like do walking meditation, and focus on simply living your everyday life as it is in mindfulness. For anyone living a halfway "normal" life, this is generally much more effective and far more natural. Even with regards to sitting meditation, there's no one way to do it. You can sit and be mindful of your breath, or you could mix it up and be mindful of the many sights and sounds within your field of awareness as well. Or you could even meditate on compassion from time to time. The choice is up to you, so find what works best for you. Some people get the idea, that is, how to be mindful, almost immediately. But most people take a while to get the hang of it. I was the latter, so if you're having some difficulty in your practice don't worry, it's only natural. There's no rhyme or reason to this, and those more proficient at first don't go on to be better at mindfulness, they just get it faster. So don't be discouraged by this and think it "isn't for you" or something else discouraging. The challenges you're facing will actually help to strengthen your practice. While mindful, it should feel as though you have a soft, but constant, focus on your object of meditation (your breath, steps, etc.) and of anything else that comes into your field of awareness, rather than a hard focus that makes you strain your eyeballs and hurt your brain. If this is what you're doing simply relax a bit and remind yourself that you're not forcing your awareness, or focus, on one point. Your object of meditation works more like an anchor helping you stay in the present moment, rather than a laser target that's concentrating your focus. If you become drawn away, by a thought or sensation, this isn't a bad thing, it's only bad if you don't acknowledge it with your mindfulness. These thoughts and sensations coming into your field of awareness are totally natural, and should be welcomed (of course after acknowledging them, come back to your object of meditation- breath, steps, etc.). I didn't get the hang of mindfulness right away, it took me some time. Get a good resource with instruction on how to meditate and simply follow it as best you can, practicing at least a little each day. As long as you're doing that, don't worry about whether you're doing it right or not. With time, provided you're doing you best to follow the instruction, you'll get the hang of it. I know you've probably seen pictures before of people meditating (who hasn't?). In those pictures, they were usually doing something specific with their hands, right? That specific hand placement is called a mudra (Sanskrit for "sign"), and it's generally meant to symbolize some important principle in the particular meditation or spiritual tradition that it originated from. Mudras can be used to enhance your practice specifically while sitting in meditation, so feel free to use them, but in no way think that they're required. In a very literal sense, you should be wide awake when you attempt to meditate, especially sitting in meditation, as otherwise, it becomes very easy to doze off. If you're not, you might need to wait until a better time or find a way to wake yourself up beforehand. This could be something simple like caffeine or something more complex like only meditating during a specific time in the day (such as an hour into your morning, when your energy is full and the sleepiness of the morning has worn off). While meditation isn't about rejecting anything or quieting your mind to the point where you stop thinking (an impossible and useless feat), the beginnings of meditation are about bringing the mind to rest. This is because, before you do this, your mind will be too active to sit back and observe, which is the entire point. A simple trick you can do to help this along is simply to stretch a bit before you begin meditating, as this will help to not only relax you but activate your body to some degree. It doesn't matter what you do, just pick a few simple stretches that relax you and do them for a minute or two before meditating. Your ability to stay focused while meditating is directly connected to your posture. Without proper posture, you're more likely to doze off and improper posture is usually an obstruction to your breathing. To some degree, this isn't something you have to worry all that much about, as often just becoming fully present will make you realize you're slouching and stand up straight. But in any case, make sure while sitting in meditation that your back and neck are straight. If you don't know it, the lotus position is that position which involves sitting cross-legged and then placing each leg on top of the opposite thigh. The lotus position is not something that everyone is capable of doing (or should try doing) even with practice. Feel free to sit in a chair, it really doesn't matter. Keep the main thing the main thing, and that's the actual act of meditating. Everything else is there simply to help support your practice, even physical positioning. Zen students avoid meditating on a full stomach, as this generally leads to an increased tendency to doze off. Of course, it can be equally bad to meditate while you're starving, so I'd suggest against that too. It's not as difficult as it sounds, just something to stay mindful of as it can affect your sitting meditation specifically. In the beginning of your practice, or even if you've practiced for some time and just had a tough day, the stress and general restlessness you're feeling can make it really difficult to meditate. To combat this, adopt a simple half-smile. We hold a huge amount of tension and stress in our facial muscles, and a light smile (a half-smile) can relieve much of that tension and stress. It's a simple act with a powerful effect. In the beginning, it's natural to become frustrated with your practice and wonder what you're doing, why it isn't working, or just feel like quitting. During this time you need to meditate more than ever. Stay focused and know that it's just a part of the process (largely, just the process of removing the jitters and stress from your body). With time, your mind will calm and you'll find a great sense of peace from your practice again, often even more than before the ordeal. Don't just breathe (or walk, chew, etc. ), while being mindful it's highly useful to count while doing so. Counting to yourself helps keep you awake to the moment and helps you notice when you've become distracted. You can simply count from 1-10, one number for each inhale or exhale. So: inhale (one), exhale (two), inhale (three), and exhale (four). If you notice yourself slip, start the 10 count over. If you have a heavily productivity centered mindset you might find yourself trying to cheat here. Don't, there's no point. All you'll end up doing is fooling yourself and hurting your own practice. The quality of your practice is dependent upon your willingness to be honest with yourself. This technique can really help you improve your practice, so don't get in the way of your own ability to get the most from your practice. If you don't set a timer, you'll have no idea when to stop and often end up pausing your meditation to glance at a clock constantly, interrupting your practice and making yourself even more uncomfortable and distracted. By setting a timer you can relax and focus on your meditation practice, knowing you won't go over your time and miss what you have to do afterward. OK, a timer isn't always a good idea. In general, my rule with a timer is that it's good to use one, but keep it in a place where you can't see it or get to it, such as up on your desk while you sit several feet away on the floor, and with your chair blocking your computer screen for good measure. This way there's no way for you to find out what time it is during your meditation, but you still know your timer is set, and so can rest comfortably knowing that you should just stay focused since your timer will tell you when you're done. But even after doing this, sometimes just knowing there's a timer set can be the very cause of your restlessness. If you find that happening, just don't set a timer. Sitting without a timer can be really pleasant, and is the way I almost always meditate. It feels more natural, like I'm free to just float off as long as I please. Of course this is a luxury I'm not always afforded, and the likelihood is neither will you, but when possible it can be really nice. Even so, after calming yourself before meditating and using a timer in the proper way, in the beginning at least, you'll grow increasingly more restless as time goes on. Maybe that time is 5 minutes, maybe it's 10, or maybe it's 20. Whatever it is, if you've only been meditating for a week, a month, or even a few months, there's a time period you'll get to where you just can't sit any longer before feeling like you're crawling out of your skin. Once you get to that point, just stop sitting. It's as simple as that. There's no reason to push it. If you do this consistently, each day, you'll gradually be able to sit down for longer and longer periods until the point where you feel as though you could sit forever peacefully without this feeling ever arising. This stage is the goal, but there's no rush to get there. Take your time, and don't sit longer than you feel you can. When you begin your sitting meditation practice, simply sit for 5 minutes. Don't attempt to sit for 10, 20, or more even if you think you can. Don't think you're Mr. or Ms. hot-shot and go into your practice ego-first, that's a sure way to stumble hard right from the get-go and lose the motivation to keep practicing. Just do 5 minutes and then expand later only IF you feel comfortable enough to do so. By sticking to this, even if you feel you can do more, you make the idea of meditation a simple and quick practice in your mind, and this helps establish it as a daily habit. With that being said, it's generally best to increase your meditation in series of 5-minute blocks. Let's say on Monday you begin meditating, and one or two Mondays later you begin feeling pretty comfortable while meditating for 5 minutes, no longer feeling the intense restlessness you once felt after a few minutes of meditating. That's a good sign you're ready to begin meditating for 10 minutes, at which point you should test it out and see how it goes. If you feel it a little tough towards the end, you can always push through it. But if the difficulty is intense, as I mentioned earlier, there's no reason to push it, so just go back to 5 minutes for another couple of days. It's important, at least with your sitting meditation practice, just as with work and family, to have a space designated for the activity. By doing so, when you go to sit down in meditation distractions go away, you become focused, and overall become more able to cultivate a strong meditation practice. You shouldn't limit your meditation practice to this one place, but it's still important to have a place like this you can go to that's reserved for your practice. This is your Zen space, as I discussed in a previous post (which was an exclusive preview of a Zen for Everyday Life chapter as well). You don't have to get personal instruction, but it's important to at least read a book on meditation to get detailed instruction on the practice, preferably various forms of meditation you can use throughout your life and for various purposes (focus on one at first though). This is all but necessary, as otherwise you're shooting in the dark and aren't completely sure if you're doing it right. By this I mean don't restrict your practice to sitting meditation only. As I mentioned, you can meditate anywhere and at any point in your day, no matter what you're doing. But it can be easy to get comfortable and just stop there. This is greatly limiting your practice. Once you get the hang of sitting in meditation, begin to try out other forms of meditation. Most importantly, bring mindfulness into your everyday life. This will really help you take your meditation practice beyond the cushion and into your everyday life, on top of being the perfect complement to your book. With audio, you can take your practice with you wherever you go. I love listening to audiobooks in my car (mostly Alan Watts right now) and still occasionally use them elsewhere as well. Test it out for yourself and see how it helps. Rolling off of this point, in the beginning, it can be beneficial to try out some guided meditations. These are enjoyable at varying levels of practice but are especially helpful for anyone beginning with meditation. Guided meditations are also nice for the same reason audiobooks are- you can take them anywhere and listen to them at just about any point in your day. Let your friends and family know that you're serious about your meditation practice. This is important for a few reasons, but an example would be letting those you live with know not to interrupt you during your sitting meditation practice. For that purpose, if you live with others and you meditate, say, in your room, then you can hang a sign on your doorknob once you begin your meditation. There are various ways this can manifest, though, so you'll have to look at your own life and take the necessary steps to let those around you know how important your practice is to you. I'm talking specifically about sitting meditation here, but if you have a scheduled time for walking meditation, or even just plan to eat your lunch or another meal in mindfulness, then it's important to reduce distractions as much as possible to improve your practice. You might think that meditation is a private affair, but it's not. Meditation is greatly enhanced when two or more people sit, walk, or meditate in any other way, together. Try it and see for yourself. Whether you're a night owl or an early riser, it can be very beneficial to begin meditating once you rise in the morning. A daily morning meditation practice is probably the single most powerful morning ritual you can adopt. It will literally transform the rest of your life with a consistent daily practice. This might happen, and it might not. Due to the sometimes difficult nature of meditation, but probably more importantly just because sticking to anything for any length of time can be difficult, it may be necessary at times to reaffirm your practice. By this I mean remember why you began meditating in the first place. Typically, coming back to your book or audio can be highly beneficial in these cases as they'll remind you of how powerful and beneficial your practice can be and usually be mixed with enough encouraging words to keep you going. In general, if this does happen, it will only be a phase. So stay strong, reaffirm your practice, and keep moving. It will wear off. Once this happens, your practice will be stronger than ever. You might be compelled to listen to some peaceful music or something while meditating, and at times this can be OK, but in general I'd suggest you learn the value of silence. Silence is a powerful and almost mystical thing really which can often leave us with no real way of describing the experience itself (of sitting in silence, for instance). Silence is healing and revitalizing, so learn the power of silence now. Not just in sitting meditation, but in all forms of meditation: silent walking, silent eating, silent driving, etc. Test it out- it's a beautiful and highly nourishing practice. It can be difficult to sit with strong emotions, like sadness or anger. To help this, it can be valuable to focus your concentration (or object of meditation, where you place your attention- typically your breath, steps, etc.) on your body. Practicing mindfulness of the body can help detect these strong emotions, and sometimes, when you're feeling restless and don't even exactly know what you're feeling, identifying where on your body you're feeling changes can help you identify what emotion it is that you're feeling. Overall, whether you've already identified the emotion or not, practicing mindfulness of body can help to bring these emotions into perspective. It helps you see that these emotions aren't any different from the rest of your body's natural processes and helps shed their sometimes monstrous cloak which make them feel to us like they're these impossible forces to overcome (which they're not). Once you've finished your meditation session, don't immediately get up and rush off to the rest of your day. It's important to take a moment after your meditation to stay in this relaxed state, look around, let your thoughts come back to you slowly, and get up only once you feel you're ready. Doing so will make your practice more enjoyable and help break the habit of rushing from place to place. Ultimately, your practice should be a great sense of joy. You won't always enjoy it, as we talked about earlier you may run into problems or your motivation to keep practicing might wane, but these things will be temporary and you'll soon go back to your "usual" practice. And this practice should be highly enjoyable, bringing you in touch with the limitless beauty and peace of all the things within your everyday life. This is in no way required, but finding a meditation community can be both highly beneficial to your practice and greatly rewarding in your life as a whole. Meditation done in groups is far more effective than alone, so even just one weekly group meditation session with people can be of great benefit. This could mean simply bringing your friends and family in on your practice as I talked about earlier, or it could mean joining a local meditation group. Whatever you decide to do, finding a group of people to practice with is something to strongly consider. Know that mindfulness isn't about getting to a point where your mind is literally quiet like the dead of night, so don't get frustrated if even after a year of meditation you still have thoughts popping up regularly. The purpose of mindfulness is to calm your mind to the point where you can observe it with clarity. You'll never completely quiet the mind, and nor is this the point. You'll greatly calm the mind and derive a great source of peace from your meditation despite this. This is definitely one of the most important points on this list because it's not just a common mistake beginners make but also a common misconception even among those who practice (at least those who haven't practiced for long). Let's take walking for instance. You might think that there's only one form of walking meditation. That is, walking while being mindful of your steps. This is the most common, but while walking you can also be mindful of the sensations you're experiencing, especially if you're outside, such as the wind hitting you and the heat from the sun on your body. The most common forms of meditation are generally the most common because they're the most universal and straightforward, but it doesn't mean there aren't ways to mix it up. Doing so can really take your practice to a different level, allowing you so many other varied methods of living with mindfulness and offering new opportunities to deepen your practice. Meditation, in all its forms, is like anything else in life. If meditation is something you want to make a daily practice, you'll need to work to establish it as a habit, and that means wrestling against all those negative habit energies that will likely try and get in the way. It won't take long to really start cementing meditation as a daily practice, but things will come up from time to time that will try to throw a wrench in your practice. Just stick with it, the longer you take your practice the more consistent you'll become and the less effort it will take to stick with it. The whole "21 days to create a habit" myth has been handily debunked in recent years, but in general anything you want to make a new habit is something you've decided you'd like to be a new part of your life for at least an extended period of time, if not the rest of your life. Because of this, it's better to stop thinking about creating habits in a short term sense and to start thinking about designing your life as a whole. This will help give you perspective and instill patience in you and is more accurate to what you're trying to do. We tend to focus too much on what it takes to create a habit, when in reality even once you've gotten to that point (whatever that point is), that thing still requires consistent upkeep or else you'll fall off. There is no magical point where a habit is just automatic for the rest of your life, only varying levels where something becomes easier and requires less effort. Have a long-term vision for your practice, and stop being pulled along by the "get it done" attitude so many of us have. Don't get confused, while mindful awareness itself is nonjudgmental- that is, while being mindful you're simply observing without purposely thinking anything and making any judgments- it doesn't mean judgmental thoughts won't arise while being mindful. Mindfulness and mental activity are two totally separate things. Mindfulness observes this mental activity nonjudgmentally, but the mental activity itself sprouting from you while meditating encompasses all of you, and that includes thoughts that have to do with your beliefs and opinions. If you notice a thought like this pop up during your meditation, don't think you're doing it wrong. As long as you're acknowledging the thought itself nonjudgmentally with your mindfulness, you're right on track. The point is, in a way, to make no purposeful effort to think or enter your mind. But your thoughts are their own monster, and they'll continue to bubble up whether you try to think about something or not. Your "effort" is to observe nonjudgmentally, not to condemn judgmental thoughts which arise. Your thoughts are not the "you" you imagine them to be. This might be difficult to see for now, but know that your thoughts are their very own monster. As I just mentioned, without even trying, while meditating thoughts will pop up. And these thoughts can sometimes be uncomfortable. But begin realizing now that those thoughts are not you, so you should in no way judge yourself for what thoughts arise. Not just while you're being mindful, but ever. Thoughts arise because of our life experiences, the effect they have on us, our interpretation of the whole thing, and general imagination which when broken down we see is hardly the "us" we imagine when thinking of ourselves. Don't take your thoughts personally, know that they'll pop up no matter what you do and involve a lot more than "you" and you'll be able to begin distancing yourself from them. If you can learn to do this, which meditation will naturally do, you'll experience a great sense of relief. Most of us are so productivity-obsessed and goal oriented that when we begin to practice meditation of any kind we tend to apply these same ideas to our meditation practice. This isn't in any way your fault, it's just something that's been ingrained in most of us since we were little (it certainly was for me). But this can only damage your practice and lead you to take less from it than you could, ironically. You can't win at meditation, plain and simple. It isn't a game, and there are no shortcuts. No matter how hard you try, aside from dedicating yourself to a daily practice and striving to be mindful during each moment in your everyday life, you have to let your practice develop on your own. You'll only discourage yourself and quit if you try to apply this same productivity mindset to meditation because it just doesn't work that way. Stop trying to win at meditation and rest simply feeling the peace of the present moment. You don't have to be doing anything in particular to meditate, you can literally just sit or stand and be fully awake to everything around you. A sort of "global awareness", this form of mindful awareness is the act of simply letting everything within your field of awareness come to you equally. It's a highly nourishing practice which can often leave you feeling a profound sense of interconnectedness with everything around you. This is a nice practice to do from time to time, the literal expression of non-striving, and simply being one with the moment fully. Once you've practiced some basic form of meditation for a few weeks, it can be highly beneficial to target some other activity during your day where you tend to zone out and bring mindfulness into it. This won't just have the "usual" impact. Making a typical zone-out activity, such as driving, into a meditation can completely transform the rest of your day for the better. The great part about this is the activities you usually zone out on are the activities you do most often, so if you pick something like walking or driving you'll also be targeting a major part of literally every single day. This can have a hugely beneficial effect on your entire life. 47. Look for "moments of nourishment"
Find it difficult to carve out time to sit and meditate? One of the great things about mindfulness is you can do it anywhere, and that means even those times you typically feel are wasted like sitting in a waiting room or in your car during a long commute. These are what I call potential "moments of nourishment", little bits of time in your day where you can slip in your meditation practice that would otherwise be unproductive or just boring wastes of time. Of course, your goal should be to practice mindfulness throughout your day, but practicing in this way is a really effective way to grow your practice in the beginning and can have a big impact on your stress level and help you find a sense of peace between the chaos and craziness of your everyday activities. I carry a Moleskine book I call my "book of mindfulness", which has various verses and phrases meant to help instill greater awareness in me throughout my day. It's a great little book which has been of much use to me. But the greatest part about the book? Because it sits in my pocket, it reminds me to be mindful throughout my day. Reminders such as these are powerful, and can really help you establish a daily meditation practice. You can read more about my little notebook in The Little Book of Mindfulness. Simply sitting or walking in nature and being mindful of the many sights or sounds within your field of awareness is highly nourishing and helps to improve your mindfulness practice. With the high amount of stimuli you can't help but be fully present for what's going on around you, and this helps you develop your mindfulness and gives you a reference point for when you practice during your everyday life. Once you've begun meditating and really seen some positive effects from your practice, it can be pretty exciting. That is, the idea that you can meditate with your whole life and bring more of those feelings into so many of the other activities you do in your everyday life. You can be mindful anywhere and everywhere and throughout your entire day. But, at least in the beginning, what actually ends up happening is usually a bit rockier than this attractive fantasy of a day filled with peace and joy. The likelihood is, you'll forget to me mindful constantly and have a hard time developing a strong daily practice. The universal application of mindfulness is great, but it also tends to make us feel lost in the beginning. Where do we begin? Even if we know that we should start by practicing sitting meditation, or at the least following our breath, the next step can be fuzzy. Unless we focus on one or a few activities at a time, we tend to end up overwhelmed and don't practice it at all (or sporadically, and never make it a daily habit). For this reason, it's highly beneficial to work in chunks. For instance, after you've practiced mindful breathing for a few weeks, you can then add walking and driving meditation to your daily practice. Don't worry about being mindful at any other point in your day, even if you know that you can. Simply take the next 4 weeks to practice walking and driving meditation at every chance you get and make those activities new mindful habits. Once you've established those, or at least gotten them to a point where you generally remember to do them consistently and can then add something else in, pick one or two more activities and tackle those. After a while, you'll start becoming mindful throughout large portions of your day and often remind yourself to practice without any effort at all, but at first it's important to focus on just a few activities at a time to gradually build the foundation of your practice.